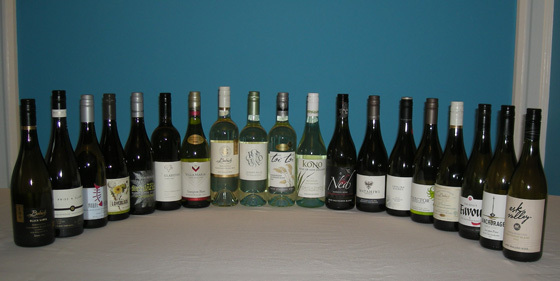 The Fifty Best held a “blind” tasting of 19 recent release New Zealand Sauvignon Blancs with 15 members of our wine judging panel. Strict tasting rules were applied. The order of service was established beforehand by lottery. Each of the wines were poured into fresh wine glasses from new sealed bottles and served chilled. Only ice water and white peasant bread were available to cleanse the palate. Grapes for this wine were sourced from a single family vineyard in the Rapaura and sub-regions of Marlborough. After gentle pressing and minimal skin contact, the juices were tank-fermented. Aroma: Green apple, green guava, peach, apricot, pineapple, white grapefruit, lemon, perfume, floral, herbaceous, grassy. Palate: Pear, apricot, lemon, lime, grapefruit, citrus, lemon curd, cream, herbaceous, juicy. Finish: Tropical fruit, sweet citrus, lemon, lemon zest, tart, mineral, clean, bone dry, good acidity, well balanced, delicate, perfect, very elegant. Grapes for this 100% Sauvignon Blanc wine were from the Southern Valley (75 %), Renwick (20%) and Lower Wairau (5%) areas of Marlborough. Following fermentation, the wine was aged for 8 weeks on its lees (wasted yeast) prior to bottling. Aroma: Green apple, gooseberry, grapefruit, star fruit, apricot, citrus oil, grassy, wet fern, eucalyptus, green pepper, barnyard, varietally correct New Zealand Sauvignon Blanc. Palate: Apricot, nectarine, gooseberry, lemon, grapefruit, tropical fruit, citrus, honeysuckle, herbaceous. Finish: Gooseberry, nectarine, juicy, buttery, clean, crisp, tart, ripe, complex. For this wine, machine-harvested grapes from a number of vineyard sites were pressed in modern membrane presses – with free-run and harder pressings fermented in stainless steel tanks to complete dryness. After aging, the various lots were blended before bottling. Aroma: Green apple, Asian pear, apricot, lime, grapefruit, citrus, lemon oil, honeycomb, milk thistle, green pepper, grassy, spearmint. Palate: Green apple, white peach, apricot, pineapple, star fruit, grapefruit, citrus, extremely grassy, herbal, bone-dry, varietally correct. Finish: Peach, lime, grapefruit, tart, smooth, balanced, gripping, very elegant, mouth-watering, consistent with Sauvignon Blanc. Grapes for this wine hailed from four Wairarapa vineyards, with vinification by utilization of yeasts able to ferment at low temperatures to preserve the essential fruit flavors of the wine. Aroma: Green apple, tropical fruit, pineapple, apricot, grapefruit, lemon peel, Juicy Fruit gum, honey, vegetal, grassy, hay, intense minerality, varietally correct. Palate: Green apple, pear, pineapple, mandarin orange, Juicy Fruit gum, fresh-cut green grass, Old World, classic. Finish: Mandarin orange, clean, crisp, perfect subtle tart, delicate. Grapes for this 100% Sauvignon Blanc were machine harvested in the early morning hours, then cool-fermented in separate lots in stainless steel tanks. Following fermentation, the wine was aged on its lees (wasted yeast) for two months before blending and bottling. Aroma: Asian pear, apricot, gooseberry, cantaloupe, grapefruit, citrus, herbal, grassy, spearmint, green pepper, New World style Sauvignon Blanc. Palate: Apricot, red grapefruit, gooseberry, herbaceous, grass, creamy, nicely balanced, varietally correct Sauvignon Blanc. Finish: Pear, gooseberry, creamy, crisp, high acidity, well balanced, varietally correct. Fruit for this wine hailed from the Wairau Valley and Southern Valley sub-regions of Marlborough. Following cool fermentation, the wine rested on its lees (wasted yeast) for approximately 8 weeks. Aroma: Golden apple, apricot, pineapple, lemon, green pepper, herbaceous, grassy, perfume, spicy, buttery, clotted cream, Thai ice tea. Palate: Gooseberry, pear, nectarine, green apple, grapefruit, citrus, grassy, mineral. Finish: Pear, stone fruit, tart, clean, well balanced. Fruit from Flett Road Vineyard (built on a hillside) was hand picked over 2 mornings and fermented at cool temperatures, then aged on its lees (wasted yeast) for 5 months before bottling. Aroma: Green apple, grapefruit, spicy, peppery, mineral, flint smoke, musty, Sancerre-like. Palate: Green apple, pear, tart grapefruit, lemon peel, citrus, slight fruitiness, herbal, mineral, bone dry. Finish: Pear, green apple, pear, tart, crisp. For this wine, fruit sourced from a “certified-organic” block in the Headwaters Vineyard was crushed and pressed into temperature-controlled stainless steel tanks and cool-fermented, after which the wine was quickly bottled. Aroma: Gooseberry, light pear, faint bubble gum, white flowers, grass, mushroom, mineral, the sea. Palate: Golden apple, green apple, pear, white peach, gooseberry, grapefruit, lime, tropical fruit, delicate, soft. Finish: Lime, crisp, tart, well balanced, soft, pleasant. Grapes from Slopes Vineyard (situated in the Southern Valleys network between Fairhill and the Brancott Valley) provided the grapes for this wine, which underwent a long, cool fermentation with select yeast strains. Aroma: Granny Smith apple, pear, gooseberry, grapefruit, lemon, honey, white flowers, olive brine, biscuit. Palate: Pear, passion fruit, tart gooseberry, tropical fruit, grapefruit, lemon, light citrus, white pepper, herbaceous, smoky, light minerality. Finish: Grapefruit, slightly tart, complex, intriguing, good acidity. Hand-picked and machine-harvested fruit were fermented separately and kept on their lees (wasted yeast) for an extended period. At the time of blending, about 10% of barrel-fermented wine was added to the blend to enhance the texture and “weight” of the wine. Aroma: Apricot, peach, passion fruit, tropical fruit, grapefruit, red grapefruit, pink grapefruit, citrus, grassy, olive brine, wet rocks, buttery, varietally correct on nose. Palate: Apple, sweet star fruit, tropical fruit, passion fruit, mild grapefruit, pink grapefruit, citrus, lemon custard, slight oak, grassy, mineral, soft. Finish: Apple, creamy, lots of flavor, very smooth, big, explosive palate. Following harvest, the grapes for this wine were gently crushed and pressed into stainless steel tanks. After cool-fermentation, the various lots were blended. Aroma: Green apple, pear, apricot, berry, grapefruit, tropical fruit, floral, vanilla, green pepper, wet stones. Palate: Apple, pear, apricot, gooseberry, green fruit, herbal, grassy, wet stone, silky, soft. Finish: Tropical fruit, tangerine, grassiness, mineral, tart, crisp, round. Fruit from several blocks of vineyards were used for this wine, which was vinified by cool tank fermentation to preserve the flavors. Aroma: Golden apple, star fruit, honeycomb, honey nectar, magnolia, herbal, mineral, briny, aromatic. Palate: Golden apple, pear, apricot, passion fruit, lemon, light grapefruit, soft grapefruit, grass, flint smoke, Gewurztraminer-like, slightly Old World. Finish: Lime, grapefruit rind, tart, mineral, nice, well balanced. Named for the summit of Marlborough, grapes for this wine were fermented in temperature-controlled stainless steel tanks, using carefully selected yeast strains. Aroma: Pear, apricot, tropical fruit, grapefruit, citrus, bubble gum, sweet vanilla, olive, hay, white pepper, stone, smoky, tangy, aromatic. Palate: Green apple, white peach, apricot, grapefruit, lime, tropical fruit, green herb, grass, spearmint gum, varietally correct. Finish: Quince, stone fruit, guava, tropical fruit, sweet citrus, floral, slightly tart, puckering, full flavored, well balanced. Grapes for this wine were sourced from a multi-terraced Waihopai River vineyard and fermented in a mix of small stainless steel tanks, new and seasoned French oak puncheons and a single large French oval tank. Following fermentation, the wine was aged on its lees (wasted yeast) for an extended period, after which it was aged for 10 months prior to blending and bottling. Aroma: Banana, light pear, sweet vanilla, subdued sweet cream, bubble gum, honey, freshly mown grass, wet stone, mineral, smoky. Palate: Green apple, grapefruit, lemon, vanilla, bubble gum, herbaceous, soft grass, oak, soft, mellow. Finish: Apricot, faint grapefruit, tart, vanilla, rich balance, lingering grassiness. Grapes for this wine were sourced from vineyards across the Marlborough region, with vinification by slow, cool fermentation using selected yeasts. Aroma: Honey crisp apple, apricot, white grape, grapefruit, grapefruit pith, dried papaya, grassy, spicy, dry hay. Palate: Green pear, gooseberry, passion fruit, grapefruit, lemon, citrus, herbal, spicy, very tart, high acidity. For this wine Sauvignon Blanc juice, pressed from whole berries, was fermented at cool temperature in stainless steel tanks and aged on its lees (wasted yeast) to build texture, while retaining freshness. Aroma: Green apple, apricot, gooseberry, citrus, grapefruit pith, flowers, vegetal, grassy, flint smoke, mineral, wet moss, musky, explosive. Palate: Green apple, pear, sweet quince, gooseberry, grapefruit, herbaceous, mineral, crisp, clean, high acid, explosive, palate cleansing. Finish: Fruity, herbal, mild musk, clean, zippy, consistent with Sauvignon Blanc. Grapes for this wine were sourced from three Marlborough vineyards – two in the lower Atawere Valley and one at the base of the Waihopai Valley. Grapes were machine harvested in the early morning, and following fermentation small amounts of wine made from Arneis, Pinot Blanc, Pinot Gris and Gewürztraminer varietals were added to the blend to enhance complexity. Aroma: Asian pear, pear, white grape, honeydew, grapefruit, explosively herbaceous, grassy, herbal, green pepper, pepper. Palate: Pear, Meyer lemon, grapefruit, green pepper, wet moss, herbal, spicy, slightly tart, almost creamy. Finish: Tropical, vanilla, creamy, pepper, flavorful, soft, crisp, tart, elegant, not overblown, varietally correct. Grapes used for this wine were from vineyard sites in the warm Wairau Valley as well as from the more southern (and cooler) Awatere Valley. Following cool fermentation, the wine was aged on its lees (wasted yeast) prior to bottling. Aroma: Asian pear, berry, green pepper, wet grass, musty, very pleasant. Palate: Apricot, grapefruit, lemon, lime, lemon peel, green pepper, herbaceous, grassy, mineral, clotted cream, tangy, zesty. Finish: Apricot, citrus, pepper, slightly tart, creamy, earthy, grassiness. This wine is a blend of grapes from estate-owned vineyards, made from juice that was primarily fermented in temperature-controlled stainless steel tanks, with a small portion fermented in oak barriques to add complexity to the wine. Aroma: Kiwi, quince, orange, lemon, citrus, light white grape, faint gooseberry, herbaceous, creamy. Palate: Green apple, apricot, kiwi, tropical fruit, lime, herbal, grassy, rich, acidic. Finish: Stone fruit, tropical fruit, floral, crisp , lovely, elegant.